The Sony Xperia go is not a phone to keep on a short leash. Not your kind of phone either if you'd say no to a dip in the pool because you are expecting an important call. The Sony Xperia go lets you join the fun. The midrange package that Sony just brought to the market aims to offer plenty of bang for your buck - and a bang of a time. The Xperia go is a smartphone that you don't need to constantly look after. The little rugged droid will have you covered in situations very few other phones will put up with, let alone survive. Drop it or sink it, the Xperia go will take it without a flinch. And there's more where that came from. Here's the short version of what the Xperia go is all about. The Sony Xperia go comes with an HVGA LCD, measuring 3.5 inches in diagonal. The screen is nothing to write home about in this day and age. Even mid-range smartphones often offer WVGA resolution nowadays, so the Xperia go is losing some points here. The good news is the BRAVIA-powered screen offers decent image quality. It may not be the sharpest around, but its contrast and colors are good enough for the price range. Sadly, Sony is still unable to fix their displays viewing angles and the Xperia go screen quickly starts to lose contrast when you tilt it to the side. It's what you usually see with phones in this budget range though, so we're hardly surprised. The Sony Xperia go, like the entire NXT line of Xperias, has a highly revamped custom skin, but it's still Gingerbread underneath (2.3.7). Hopefully the Xperia go will be among the devices, scheduled to receive Ice Cream Sandwich later this year. The Xperia go has the usual five-pane homescreen (you can't add or delete panes), with four docked shortcuts (two on either side of the launcher shortcut). These are visible on all five homescreen panes and are user configurable: they can be either single icons or folders with multiple items in them. The homescreen does a neat trick called Overview mode. Pinch to zoom out on any of the 5 homescreen panes and a new screen opens up with a cool transition. All active widgets gather there for easy viewing and selection. The Xperia go has some custom-made Sony widgets in addition to the standard set. Those include the Timescape widget (there's a dedicated app too) and a Mediascape-like widget for photos and videos (the actual app isn't there anymore, the standard gallery is back). The lockscreen shows notifications for Facebook events too, courtesy of Sony Facebook integration. A cool new addition to the lockscreen, unseen in the old Xperia line, is the music player widget, which lets you control music playback without unlocking the phone - we'll get back to this further on. The standard notification area and task switcher are of course present and accounted for - no custom touches to them. The visually customized phonebook of the Xperia go can store extensive information about all your contacts. A tabbed interface presents contact details, recent calls and info from social networking services. You can sync with multiple accounts, including Exchange and Facebook, and you can selectively show or hide contacts from some accounts (you can fine-filter specific groups from an account), or set the phonebook to display only contacts with phone numbers. We had no problems calling and receiving calls on the Xperia go. The built-in secondary microphone is used for active noise-cancellation so calls are loud and clear even in noisy environments. The Xperia go offers smart dialing. It searches for matches in both the contacts' phones and names. There's voice dialing too (the quickest way to activate it is the dedicated homescreen widget). Thanks to the proximity sensor, the Sony Xperia go automatically disables the touchscreen when you hold it up to your ear during a call, thanks to the proximity sensor. The call log is integrated in the dialer - it shows a list of recently dialed, received and missed calls in the top half of the screen and the keypad on the bottom half. Once you start typing, the call log is replaced by the smart dial list. As for text input, the Xperia go offers a customized on-screen full QWERTY keyboard. Typing on the portrait keyboard isn't very comfortable - keys are tall and thin, making for a lot of typos. They're just not as well spaced as on the bigger Xperia S and ion displays. Flipping the phone to landscape gives you bigger, easier to press buttons. Word prediction is present in the Xperia go keyboard. In terms of customizations, the Xperia go keyboard features the so-called Gesture input. It works the same as Swype. Even if you've never used Swype input before, you'll quickly get used to it. The Xperia go uses the traditional vanilla 3D Gallery, which hasn't really seen much change since Android 2.2. It still has good functionality, cool 3D looks and nice transition effects, and thankfully shows full resolution images. The different albums and folders appear as piles of photos, which fall into neat grids once selected. If you have online albums over at Picasa those show up as separate stacks as well. You should have noticed the two switches at the top by now. The first opens a different gallery section that stores your 3D panorama shots, while the second opens the Sweep Multi Angle shots section. To view the 3D panoramas in 3D, you need to connect your phone to a compatible 3DTV. Multi Angle shots are harder to view outside the device as you need something with an accelerometer and the proper app - you best bet is another Xperia. Facebook and Picasa albums are distinguished by the small logo of the corresponding service. Facebook pictures can be "liked" with the thumbs up button in the upper right corner and commented upon at the bottom bar. You can use pinch zoom or the old-fashioned +/- buttons. If you pan past the edge of a photo, the gallery will load up the next (or previous) image. Images can be cropped or rotated directly in the gallery. Quick sharing via Picasa, Email apps, Facebook, Bluetooth, MMS, etc. is also enabled. The BRAVIA engine enhances contrast and colors by sharpening the image and reducing noise. These steps would normally lead to artifacts, but you'll have to look from really up close to notice. You can switch BRAVIA off, but we recommend keeping it on - it really improves the image quality. There is no dedicated video player app on the Xperia go as in most of the droids out there. DivX and XviD videos are supported but the Xperia go has a rather selective filtering and not all videos got through. The Xperia go's NovaThor processor refused to play any of our test 1080p videos, while 720p videos worked fine. You can, of course, download a third-party video player off the Android Market like the MX Player with the corresponding codecs - it ran everything, up to 720p, with subtitles. The Xperia go shares the same music player as the Xperia U, P, S, sola, etc. You're welcomed to a Cover Flow-like interface and you can swipe left and right to skip tracks (complete with a smooth 3D effect). This is the Playing tab, the second tab available is called My Music and it's where your music library is organized. Tracks are sorted by album, artist, playlist, all tracks, SensMe channel, favorites. There's also a link to Sony's Music Unlimited service. In the Now playing interface, there's the familiar Infinite button - it gives you quick options to find the music or karaoke videos on YouTube for the current song, look for similar tracks on PlayNow, search Wikipedia for info on the artist or look up the lyrics on Google. New features can be added to this menu with extensions available in the Play Store. SensMe should be familiar from those old Sony Ericsson Walkman phones. In case you've missed it, SensMe filters songs by mood. By default, there are nine "channels" - daytime, energetic, relax, upbeat, mellow, lounge, emotional, dance and extreme. You need to download SensMe data before you can use this feature. Luckily, you no longer have to use aPC Suite to tag songs - you just need an Internet connection, the phone will handle the rest. Audiophiles will appreciate the rich selection of equalizer presets. There's a custom preset too - it lets you adjust five frequency bands and there's a Clear Bass slider too. The More tab offers a Headphone surround option, which can be set to Studio, Club or Concert hall. If you're not using the headphones, you can turn the xLOUD feature on, which optimizes the sound for the device's loudspeaker. A new feature is the track info and playback controls available on the lockscreen, which let you control the player without having to unlock the phone. The music controls replace the clock, which might be annoying if you just want to check the time. Still, the clock slides out of view, so you have about a second to see what time it is (or just look at the small clock in the upper right corner). The Sony Xperia go is equipped with an FM radio, which has a really neat and simple interface. It automatically scans the area for the available stations and places "notches" on the frequency dial for easier scrolling to the next station. There's a Force mono option to use in case of poor reception. The Sony Xperia go did really well in the first part of our audio quality test. When connected to an active external amplifier the smartphone got some excellent scores , showed no weak points and had just above average volume levels. The degradation when headphones come into play consists of a rather small hike in stereo crosstalk, but quite a large increase in distortion levels. It's not too bad, but extremely demanding audiophiles might be left slightly disappointed by the Xperia go on this occasion. 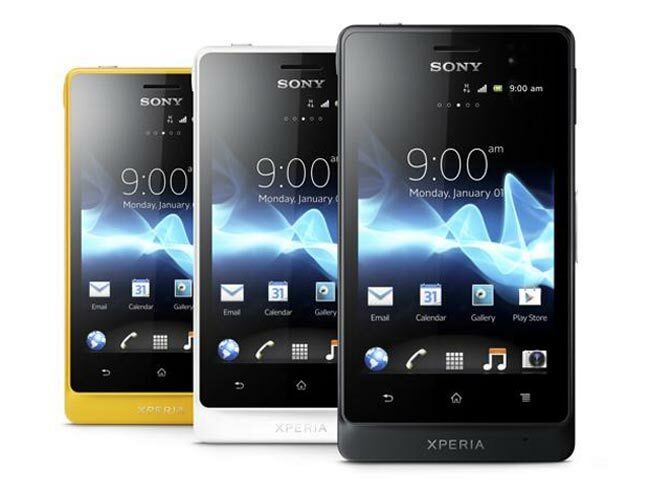 The Xperia go boasts a 5 megapixel camera, complete with a single LED light. It's capable of producing images of 2592Ñ…1944 resolution. An added bonus is that you'll be able to capture stuff under water (no deeper than a meter, mind you), which is especially neat for video recording, we imagine. The camera controls on the Xperia go are available on two taskbars on either side of the viewfinder. On the left you get four shortcuts to various settings, while the still camera/camcorder toggle, the virtual shutter key and a thumbnail of the last photo taken are on the right. There is no hardware shutter key like on some higher-end Sony droids. There're five capture modes to choose from: Normal, Scene recognition, Sweep Panorama, Sweep Multi Angle and 3D Sweep Panorama. In Normal, you pick the Scene settings manually or you can enable Scene recognition and let the Xperia go take a guess (it's fairly good at it). The 3D Sweep Panorama is business as usual - you press the virtual shutter key and pan the phone across the scene. The resulting panoramic photo can be viewed in both 2D and 3D (on a compatible TV). There are some distortions visible even in a static scene, but it's still one of the coolest camera features we've seen in a while. Photos taken in Sweep Multi Angle mode are handled by a separate app called 3D album, and not listed in the regular gallery. And just to be clear, the Xperia go doesn't have a 3D screen. It cleverly relies on its sensors to detect the handset movement and it changes the on-screen image accordingly. The Sony Xperia go's forte isn't imaging but it still churns out impressive results. Images are very sharp and crisp for this price range. Detail is more than pleasing and the only place where the Xperia go could improve is color reproduction with the images being slightly dull. Otherwise, the Xperia go offers a very good level of still capturing skills and would easily step in for an opportunist's digicam. Here go the results. Macro is another area where we got pleasing results with the Xperia go. It retained the good level of detail from very close and you don't need to switch to any particular scene mode like Close Up or Macro - the camera just focuses on the touch of a finger. We have to say we are a little surprised as we didn't expect such excellent results from a device meant to takle rough terrain. The Xperia go joins the long list of tested devices in our photo comparison tool. We've pre-selected the Samsung Galaxy Ace 2 and HTC's One V for but feel free to select any of the other devices we've tested so far. The Sony Xperia go captures 720p video at 30 fps. It cannot do 1080p even though it offers a dual-core processor. The camcorder has similar settings to the still camera, including focus mode, metering, exposure value, image stabilization and so on. The layout of the shortcuts can be customized here too. The Xperia go's camcorder features continuous autofocus. It may take a few seconds to refocus after you re-frame but that's better than repeating attempts to lock focus that may ruin a video. In fast-paced videos the continuous focusing could get a little hectic and focus every second or two, but you can turn the setting off. The Xperia go produces good videos with a stellar bitrate of around 12000 kbps and a healthy 29 frames per second. The videos are smooth and focusing is pretty accurate and fast. The continuous autofocus isn't as hectic as on some of the competition (here's looking at you, LG). Detail is good throughout but could be better - it's not spectacular but it does the job. The Sony Xperia go has quad-band 2G and dual-band 3G. Mobile data speeds are boosted by 14.4Mbps HSDPA and 5.76Mbps HSUPA. Local connectivity is covered by Wi-Fi b/g/n with DLNA, Wi-Fi Direct and hotspot functionality, and you can easily play media (photos, videos, music) from DLNA-enabled storage devices or push content from your phone to a DLNA TV or music player. Stereo Bluetooth is version 3.0. To complete the tally of available options, the Xperia go features a microUSB port for charging and data transfers and luckily, it's is among the few new Xperias to feature an expandable storage option via microSD. The Xperia go lacks NFC support and also doesn't come with Sony's media remote app preinstalled. ANT+ wireless technology for communicating to various sports accessories is not supported as well. The browser supports double tap and pinch zooming, along with the dedicated virtual zoom buttons. There's text re-flow, which reformats text so that it best fits on the screen. The browsing performance is excellent - panning, zooming and the text reflow are snappy. The Sony Ericsson Xperia go comes with a solid set of organizing options, including a document viewer. Reading documents is okay on the 3.5" screen and panning is blazing fast. There's a built-in file browser and cloud storage integration (Google, Dropbox, Box). There is a calculator aboard. It is nicely touch optimized - the buttons are really big and easy to hit. You can expand advanced functions (trigonometry, logarithms) by turning the phone in landscape. The app has also offers a World clock along with stopwatch and timer functionality. There are also several fitness apps pre-installed on the phone - such as Adidas miCoach or the pedometer-tracking WalkMate, but these are freely available from the Play store anyway so they do not make that much of a difference for the Xperia go. The Sony Ericsson Xperia go comes with a GPS receiver, which took less than a minute to get satellite lock upon a cold start. You can use the A-GPS functionality to get near instantaneous locks. Alternatively, network positioning will do if you only need a rough idea of your location. You can plan routes, search for nearby POIs and go into the always cool Street View. Our Xperia go came with a Wisepilot trial with 30 days' worth of full navigation license. The app offers live info on weather, traffic, speed cameras and alerts. We just can't promise you that your Xperia go will also come with the same Wisepilot license, it may be a market-dependent feature. The Google Play Store is the place to go for apps on Android. it's a phone that's supposed to make a living off the beaten track, but the Xperia go plays it safe by following closely in the Xperia active's footsteps. Sony have given it a bigger screen and two processor cores and that's as solid an upgrade as any. They've done well to change the styling too, in line with the new NXT series design language. The Xperia go feels less sporty and muscular than its predecessor but we think it's one of the better-looking durable phones you can get. The solid single-color-body with no flashy accents is perhaps a bit too conservative but we don't mind at all. The Xperia go belongs in a backpack but wouldn't be out of place in an office either. It's a rugged little handset that will appeal to urban and wilderness adventurers alike. Accordingly, it has some relevant apps preinstalled - like a compass and a torch. There're some fitness applications too in a featured homescreen folder but they're not what we would call a decider. All the apps are available on the PlayStore. There's nothing exclusive about them, any Android phone can have them.